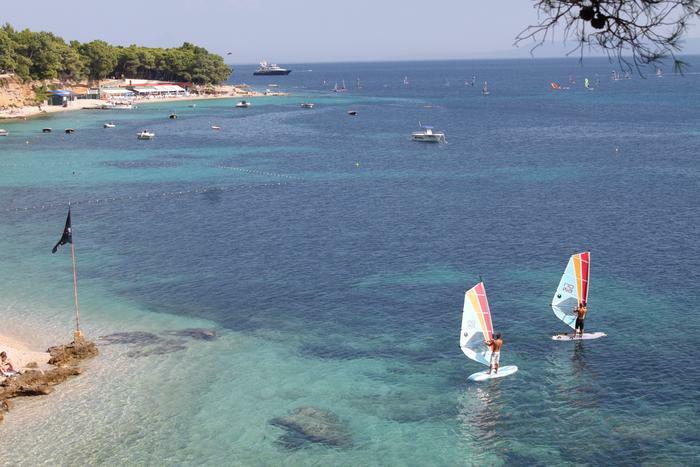 The first windsurfing enthusiasts started arriving in Croatia as early as the 1970s. The desire to "ride the waves" has with time become something more than a mere sport. This perhaps most attractive summer game is now embraced as an important part of Croatian tourism. If you choose to make this a part of your summer, Croatia will gladly welcome you to her best windsurfing destinations, both along the coast and on the islands. In steady winds, even the most demanding surfers will find the perfect waves for their boards. One of the chief windsurfing locations is Premantura on the Istrian peninsula. Croatia's most famous beach likewise has much to offer in thsi respect, in Bol on the island of Brač. Numerous regattas and international competitions await boarders in Viganj on the Pelješac peninsula. The mornings of these Dalmatian towns are usually blessed with mild winds, perfect for beginning windsurfers. Nor will Croatia disappoint the skilful surfers, who will come into their own in the afternoon northwest wind, the mistral. No matter what your skill level is, all along the coast there are windsurfing clubs and schools, while regattas and competitions are held on a regular basis. Croatia invites you to find your ideal wind and the perfect waves. Stari Grad on Hvar - one of the best European destinations in 2017! How to spend 7 days in Istria? Best Croatian wines you must try! Island of Vis Has the Most Beautiful Beach in Europe? 'Star Wars' | Episode VIII filming in Dubrovnik! 4 great reasons for vacation in Croatia! TOP 5 destinations on the Makarska Riviera! Kvarner – wreck diving as a tourist attraction! Dubrovnik is home of a surprising event in Game of Thrones! What happened at Joffrey's wedding? ADRIATIC ISLANDS: 5 less known dream holiday oasis! Advice on traveling with children and pleasant stay on the Adriatic! Mediterranean Diet a Part of UNESCO! Top Free Attractions in Croatia! Vis Island "Crazy About" Cricket? 101 Blue Flags Along the Adriatic! And the Oscar goes to... Croatia! Summer on the Adriatic - choose your destination now! Korčula wishes you a Happy Half New Year! Adriatic.hr presents a "Croatia guide"
The very best of Croatia! Easter on Hvar: meet the procession "Follow the cross"
European Museum of the Year in Croatia? Rab an Ancestor of San Marino? "Aromatic" Holiday? Hvar is Waiting!